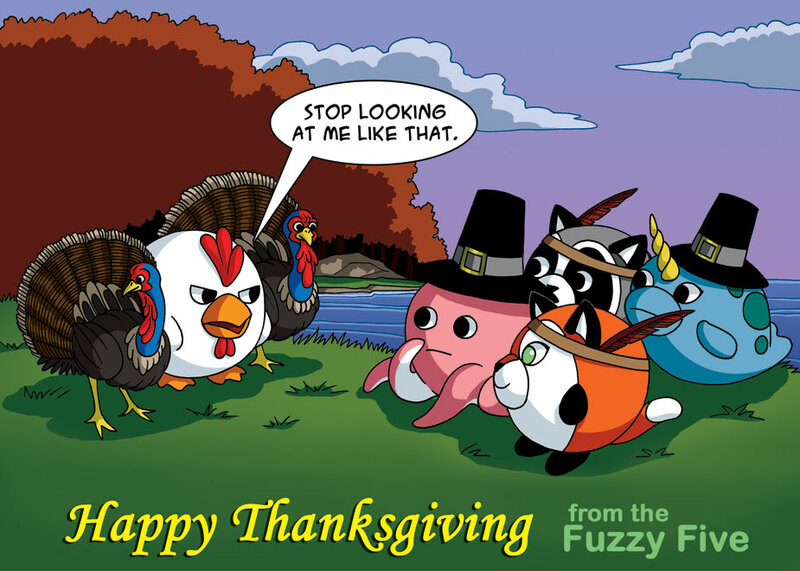 May you all be surrounded by…friends this Thanksgiving. Breakfast, defender of turkeys? Hee! Owner of too many Squishables to count! Brrakfast has some friends! P.S. make a turkey Squishable! A bit early, aren’t we? Well, his name IS breakfast.. The pilgrims were confused, and learned later that the turkeys (and chicken) were not for new hats. That night, Nina Jr. and Otto left, realizing that they really didn’t like poultry as much as their friends wearing feathers, and not nearly as much as their feathered friends. I thought fuzzy five updated on Monday and Wednesday Has this changed? We’re doing Fuzzy Five on Mondays only for the time being! the birds have to stick together! They should make an annual Squishable Day! !